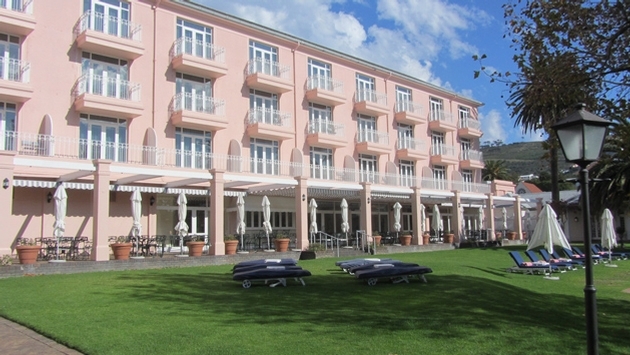 When I posted to Facebook a photo of The Mount Nelson Hotel, where I am staying for four nights in Cape Town, someone called it “The Grande Dame.” I can certainly go with that. There are many great hotels in this uniquely beautiful city, and I have stayed in a few of them, but the Mount Nelson has to be one of the best. It’s about as fine as a hotel can be. More than a century old, it has rich vintage feel, history you can sense in its walls. It stands tall and proud, not tall like a high rise, but about four stories tall like a grand aristocratic mansion. It’s stately and elegant, but its tropical pink color keeps it from looking too serious. It sprawls out broadly with several additions built onto the main building. The Mount Nelson stands on the slopes of Table Mountain. In a sense, the whole city is on the slopes of Table Mountain, but Mount Nelson is quite far up the side in a location that feels as though it stands over the city. In the heart of the original settlement of Cape Town, the hotel is surrounded by a range of mountains with Table Mountain at its center, Devil’s Peak at one side, the Lion’s Head and Signal Hill (or the Lion’s Rump) on the other, and trailing off to the side, the 12 Apostles. Some of the rooms have views of Table Mountain or the Lion’s Head. At the gates to the hotel grounds is a construction of Greek-style columns like a little mini-Parthenon. Once you get past the security officer you drive up a long palm tree-lined driveway to the main entrance. When you arrive you feel cloistered within a garden area. There are many great hotels down by the Victoria and Alfred Waterfront, and that is a preferred location for many visitors, but Mount Nelson is closer to the older inner city. At the waterfront there’s a giant mall packed with flashy storefronts, all looking brand new, with many of the most famous international brands represented. But the downtown area, where Mount Nelson is located, has the older, traditional buildings of this 400-year-old city. From the hotel it’s only a short walk to the downtown part of Cape Town, including Long Street, with its strip of colorful boutiques, shops, restaurants and bars. They are not the big corporate entities, but small businesses with a strong sense of local culture. The Mount Nelson has a spa, a friendly gym, a pretty swimming pool and beautiful lawns with arresting sculptures placed here and there. Fine paintings decorate the walls throughout the public areas. A taxi driver tonight told me it’s the number one hotel in Cape Town, and I don’t know exactly what that is based on, but I’m sure many who know the city would take it as a self-evident fact. My time here, unfortunately, is drawing to a close, but I am grateful to have this place and this time in my memory bank. I hope to draw on it for a long time to come.